Unless you’re really sick, or have been in an accident, I bet you don’t go to your doctor’s office without hopping in the shower first. At the least, you probably put on clean underwear. I bet you do, or rather I hope you do. But the same can’t be said at the veterinary office. When I lift up a pet’s tail, chances are pretty good I’ll find stinky mats, and not new ones, either. Double-coated dogs like Collies will have an uncomfortable layer of felt-like mats where their soft undercoat should be. Spaniels will have mats behind their ears, and longhaired cats will have mats … well, everywhere. Mats can be very painful. If you’ve ever had your hair in a too-tight ponytail (or just had someone pull on your hair), you have an idea of what your pet is going through. And mats can hide things like wounds (or worse, wounds with maggots), and it’s not until you clear the matted fur away that you can see how bad things are at the skin level. I’ve written before about how I like to use my nose as a diagnostic aid, but the masking stench of some filthy coats makes that a challenge. 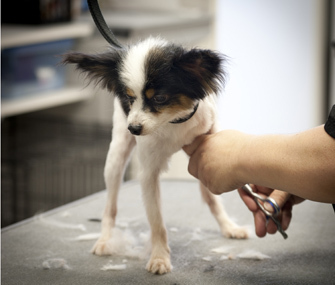 In other words, grooming isn’t just about looking and smelling good — it’s part of your pet’s overall wellness. And it’s the part that is all up to you. Get on a schedule. Forget that old saw about bathing dogs every six months (or even annually). You can bathe your dog weekly with no problems at all. In fact, frequent bathing can help some skin conditions as much as medication in some cases, and in many cases will work with medication to calm troubled skin. When it comes to your own allergies, weekly bathing of your pets (yes, cats, too, although just a rinse in clean water works fine) will help by removing the pet dander, dust and pollen your four-legged Swiffer picks up. As for brushing, a couple of times each week works well for most dogs and cats. You should check daily for mats and burrs, though; they’re easier to manage if you catch them as soon as you can. And while you’re feeling for mats and burrs, be sure to check for ticks, too.